Have you ever been wondering about how to convert PPSX to MP4 online? I bet you have as this is fairly common to people who need to do presentations a lot and would like to save their PowerPoint files in a far more common video format such as MP4 in our topic. 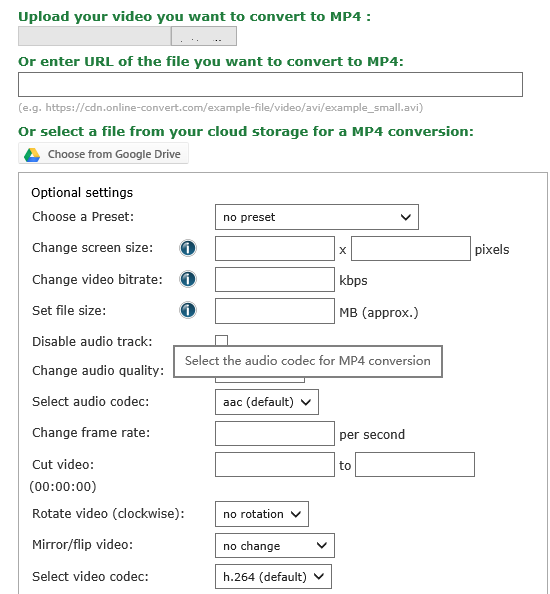 To save your effort, here is a ready-to-use guide for you to learn how to convert PPSX to MP4. According to Fileinfo, a PPSX file is a slide show created by Microsoft PowerPoint or another presentation program, such as OpenOffice Impress or SoftOffice Presentations. It contains a finished collection of slides that are used for slide show playback. Once saved, PPSX files cannot be edited and may only be viewed. Since this is an uncommon file format and it is less dynamic, people keep searching ways to convert the PPSX files to other formats such as MP4 for better enjoyment and more flexible saving. In terms of this, I would love to share two powerful PPSX to MP4 converters to you. 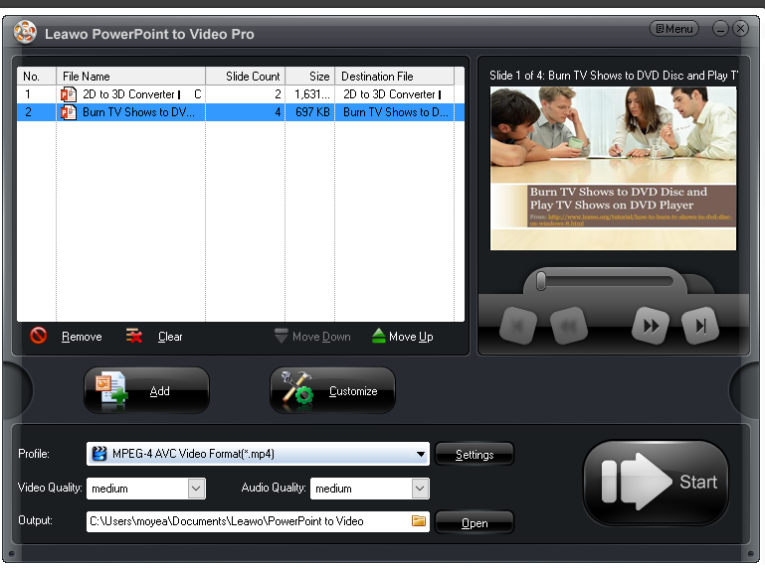 The first PPSX to MP4 converter would be Online Convert, which is a freeware online. If you are looking for some cheap and easy way to convert PPSX to MP4 online, this is absolutely the best choice for you. It is developed to help users convert files from one format to another, which covers almost all popular file formats. As you can see from its website, the procedure for converting PPSX to MP4 free online is quite handy, even for beginners. Step 1: Upload files or enter the URL to locate the PPSX file. Step 2: Perform optional settings such as bit rate, video codec, and so on. Step 3: Click “Start conversion” to convert PPSX to MP4 online, before which you need to set an output path by log into their websites. After the conversion completes, you will have your MP4 video for enjoyment. To be honest, not all people prefer online freeware to some professional programs, which can provide users with one-stop solutions for whatever they want to convert. If you are looking for a better and more professional PPSX to MP4 converter,Leawo PowerPoint to Video Pro should be highly recommended here. 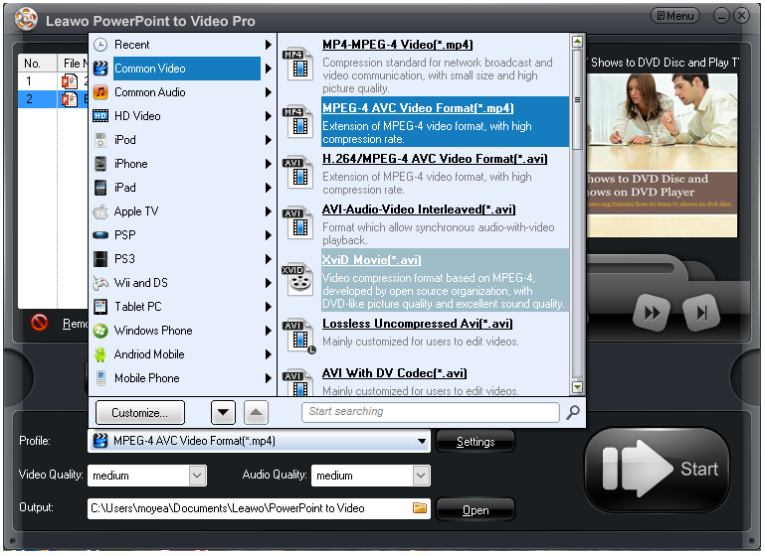 This program is exclusively developed to convert all kinds of PowerPoints file to videos in all common video and audio formats, such as ASF, AVI, FLV, MPEG, MP4, TS, MOV, WMV, VOB, 3GP, RM, RA, MKV, WEBM, MKA, Wii AVI, Wii MOV, etc. This powerful program is able to retain all elements in a PPSX file, like animations, transitions, sounds and video clips. Moreover, users are able to add background music to the PPSX file and even make their own logo on the file. In the following, there is a demonstration guide to show how to use this program to convert PPSX to MP4 efficiently. Step 1: Download the program. Click the below button to download the program. Install in on your computer after downloading completes. Step 2: Add the PPSX file to the program. Click “Add” to add the PPSX file to the program. Batch uploading is supported. Step 3: Set the output file format. Select the output file format from the Profile drop-down list, which contains a variety of file formats. Here we select MP4. Then, set a directory to save the converted file on the “Output” box. Click “Customize” to enter the “Advanced settings” page. Here you could set timing between slides, music, audio, and so on. Click “Watermark” on the Advanced settings page and you can set a customized logo on the file. Step 6: Convert PPSX to MP4. Click “Start” to convert PPSX to mp4 finally. The green bar will tell you the conversion progress. Once done, the videos will be found from the folder that you set in step 3. Comparing the above two mentioned PPSX to MP4 converters, we find that Online Converter is suitable for users who requires simple and free file conversion service. This freeware requires users to stay online during the whole process, and users need to agree with the terms, which may involves privacy leakage to some extent. 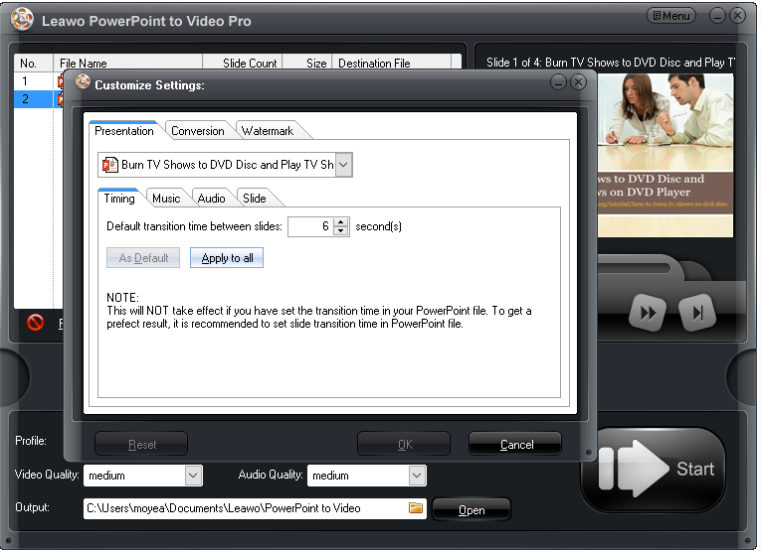 Leawo PowerPoint to Video Pro is more suitable for users who have higher requirements on the conversion output, such as timing for each slide, watermark, music, etc. It can work offline, which is also good for users who don’t have internet access all the time. Besides, it does not have any privacy leakage issue. All in all, both PPSX to MP4 converter online free and paid PPSX to MP4 converter have their pros and cons. Try it out based on your preference.